Sensor interfaces devices enable a user to connect sensors to devices such as PCs, PLCs, Tablets, SmartPhones or dedicated LED/LCD displays. Loadstar Sensors provides a number of interfaces that can connect to Load Cells, Torque Sensors, Displacement Sensors, Pressure Sensors, level and other sensors and offer either Analog outputs (0-5 VDC) or Digital Outputs (USART/UART, USB, XBee (802.15.4), WiFi or Bluetooth). We make it easy for you to get data from your sensor and transport it to the end device. DI-100U The DI-100 Digital Load Cell Interface modules provide a simple, convenient method to convert existing milli-volt output load cells into PC friendly USB Load Cells. Native UART output can be accessed from miniB USB connector by removing the S2U Serial to USB dongle that converts signal into USB. DI-400U This is essentially a four channel version of the DI-100U. It enables a user to quickly connect up to four 4-wire load cells to this interface, digitally calibrate each and then obtain calibrated force/load/weight values from all four connected load cells via a single USB output on a Windows PC. By using this solution, you can save time, money and a lot of headache of using a junction box and performing an analog summation from multiple load cells since each load cell is digitally calibrated and calculated weights/forces are summed digitally! This is the easiest way to build a scale with four independent measurements at the four corners of a frame/platform. AI-1000 Signal Conditioner is an interface designed to amplify tiny millivolt signals such as those from strain gauges arranged in a Wheatstone bridge configuration and provide a 0 to 5 V DC output. This is a simple 6-digit bright RED display that works with most 4-wire resistive load cells. The load cells need to be connected to this display and calibrated in either tension or in compression to it with known weights or forces. Once calibrated this display provides a numerical display in lb or kg. This unit is made of stainless steel and offers an optional battery operation capability. Programmable Gain 1 to 64. Dimensions 4.2" x 1.2" x 0.8" 9" x 5.25" x 1.5" 4.5" x 2.5" x 1.3" 4.5" x 2.5" x 1.3" 4.5" x 2.5" x 1.3"
DQ-1000U This device connects to an iLoad Mini Load Cell, provides regulated power needed to power the load cell, reads the frequency signal from the load cell, applies calibration values to the signal and provides a digital output of the calibrated force, load or weight values. The output signal is available via UART (Serial TTL) or via USB through the S2U Serial TTL (UART) to USB adapter. The output data can be obtained at up to 500 Hz using the DQ-1000UHS version of this device. This is a four-channel version of the DQ-1000U interface. But in addition to UART and USB, this device offers wireless communication and battery operation capability via the DQ-4000ZP version of this interface. By using four iLoad Mini load cells with a DQ-4000 interface, one can quickly build a moderate accuracy scale with USB or Wireless output. In addition to all the features offered by the DQ-4000 miniature load cell interface, this device has a built-in LCD screen that displays the individual readings of each load cell as well as the sum total of all connected load cells. for applications that cannot use a PC or Tablet as a display, this device provides a quick and easy display solution while still enabling data collection on a PC via USB or Wireless protocols. This break-out board helps users of our iLoad Series digital load cells, get easy access to the analog output of the load cell via a terminal block. It can also be used to access the Serial TTL pins to communicate with devices such as the iLoad Series USB load cells or with USB load cell interfaces like the DI-100U, the DQ-1000U, the DQ-4000U, the DS-4000U or the SC-1200 sensor router. The digital load cell can be powered either through the USB port of a PC or directly from a power source via a pin on the terminal block. Using this board, one can obtain both a digital readout on a PC for logging application, as well as use the analog 0-5V DC signal as an input into a DAQ or a PLC. The SC-1200 is a scalable data acquisition system for measuring loads and forces using Loadstar’s iLoad series load cells. Each SC-1200 supports up to 12 iLoad Series load cells, iLoad Mini+ DQ-1000U pairs or resistive load cells connected to a D1-100 interface and calibrated together. 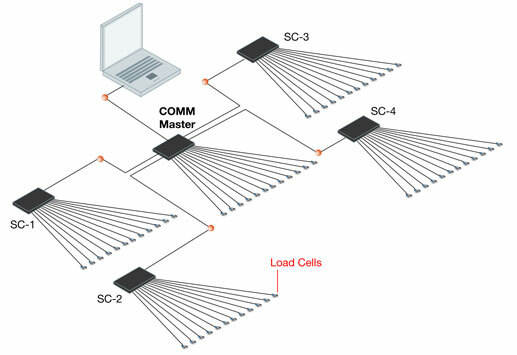 Multiple SC-1200s can be daisy-chained together to form a sensor network of up to 3000 load cells. Only a single uplink to the host PC is needed to access any or all sensor data in the farm. Wireless XBee or Wifi uplink option is available with a 1000 ft range.